Claudia L. Johnson specializes in 18th and early 19th-century literature, with a particular emphasis on the novel. Johnson is working on several book-length projects: an edition of Austen’s The Beautifull Cassandra with drawings by Leon Steinmetz, forthcoming Princeton University Press, 2018), 30 Great Myths About Jane Austen, with Clara Tuite, forthcoming from Wiley-Blackwell in 2019; and Raising the Novel, which explores key phases the history of the history of the novel in which critics have attempted to elevate them to keystones of high culture. 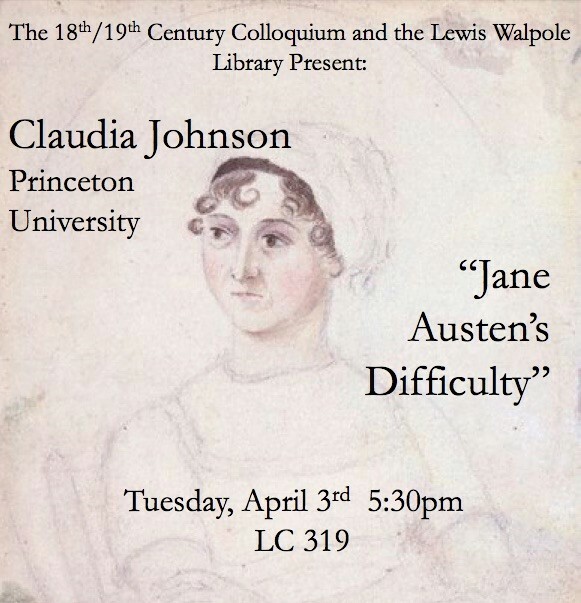 This lecture is being given in connection with the 23rd Lewis Walpole Library Lecture: Pride, Prejudice and Portraits: The Rice Portrait of Jane Austen, being held on April 4th. For more information about this event, please see our Lectures & Conferences page. Both lectures by Professor Johnson are open to the public.